Parga is situated in the prefecture of Preveza in the south western part of the region of Epirus. 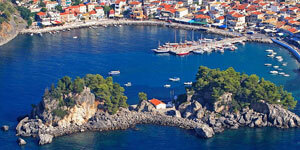 Today the area prefecture includes Parga, the villages of Agia, Anthoussa, Agia Kiriaki. With approximately 4000 inhabitants it is the most important tourist destination of Epirus and one of the most famous Greek of tourist resorts. As well as specializing in tourism Parga also produces fine olive oil, regarded as some of the best oil in the area. Beautiful nature, spectacular coast line, the lovely beaches and the emerald colors of endless olive groves makes Parga the 'jewel of Epirus'.